Today marks the 100th anniversary of the end of the First World War. It represented the industrialisation of warfare and a taste of what was to come. Australia’s role in the war was significant. Some have said it is really the only war where Australia has fought the major enemy on the major front. That being the Germans across northern France. Australia’s role in the war wrought over 215,00 casualties. In the 4 years of War approximately 416,809 had joined up and of these 313,814 had embarked for duty overseas. 65% of these were killed or wounded compared to 51% for Britain, 50% for Canada and 59% for New Zealand. Nearly 40% of all Australian males 18 – 44 voluntarily enlisted. One in five or 63,163 died on active service during the war. 313,814 embarked from Australia of which approximately 295,000 served on the Western Front. 53,000 died in France and Belgium, 18,000 have no known grave, 152,171 wounded. Between 27 March and 5th October 1918, the AIF made up less than 10% of British forces but captured 23% of the prisoners, 23.5% of the enemy guns and 21.5% of the ground taken from the Germans. 52 Victoria Crosses were awarded to Australians who fought on the Western Front. Many did not survive and live to receive their honour. Over 13 million people were killed during the war and it would prove not to be the war to end all wars unfortunately. So on this 100th anniversary we pause, remembering those who died and never returned, those who served and did return and the many other who continued to serve when this country called. All we can do is say thank you and promise never to forget. 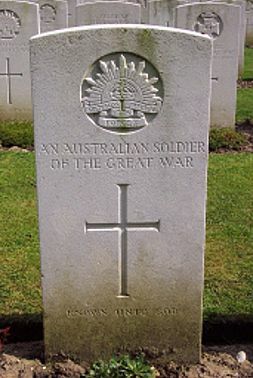 For more information on the Australian battlefields of World War One wish my website www.anzacsinfrance.com.